8 March 2017 marks the International Women’s Day and the European Trade Union Confederation (ETUC) calls for narrowing the gender pay gap and boosting the economy via its Pay rise campaign. Women joining a trade union: the wage gap among union members is less than half of the wage gap among non-union workers. In the meantime the European Transport Workers’ Federation (ETF) is in full swing organising its Women’s Conference, to take place on 23 May 2017 in Barcelona. More than 100 union leaders and women transport workers from across Europe will gather together to take stock of past achievements and look into the future gender equality activities. 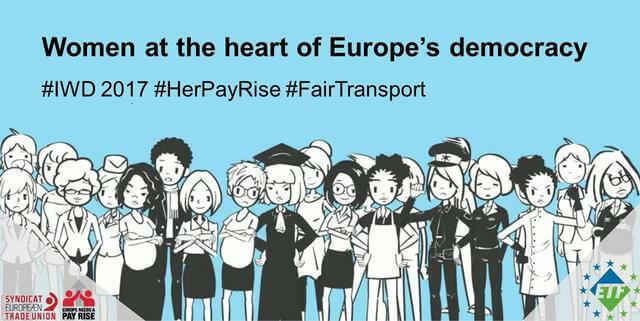 The conference will also promote fair transport and fair working conditions, which will be the key element of the ETF Gender equality work programme for 2017-2022 entitled “Fair transport in Europe, fair jobs for women”. The ETF Women’s Conference will also set the scene for the presentation of the key findings of the ETF survey on workplace violence against women transport workers. During a 3-month period (25 November 2016 until 28 February 2017), more than 1,400 women transport workers shared their experiences on workplace violence. This evidence will be crucial for the development of the ETF policy to eliminate violence against women transport workers. The work will start as soon as the newly elected Women’s Committee takes up its work after the ETF Women’s Conference.